If you are looking for some cheap Disneyland hotels, these Anaheim hotels near Disneyland main gate are perfect for your best Disneyland California vacation. Save 50% or more on the price of your Disneyland vacation by choosing from the Disneyland area hotels within easy walking distance of Disneyland and California Adventure theme parks. These are some of my favorite hotels because they have location location location. 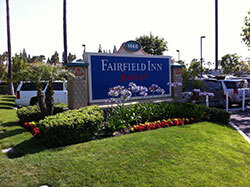 Right across from the maingate, with easy walking distance to Disneyland and California Adventure. If you have small kids and are staying multiple days, it's very convenient to take a break in the middle of the day for nap time or pool time, before you return to Disneyland for the parade and fireworks. There are also a number of restaurants so you can save money and get better quality food outside the park. We like to stay at one of the non-Disney Anaheim CA hotels right across from the Disneyland entrance. There are many to choose from, including budget hotels to luxury hotels. There are also many inexpensive restaurants located along the strip of hotels, and nearby you can find many restaurants and a movie theater in the citywalk. All of these are cheap Disneyland hotels compared to the more expensive Disney hotels in downtown Disney. There are additional cheap hotels near Disneyland within walking distance. To find reviews of these hotels, we recommend aRes Travel. You can find great discount hotel rates too! 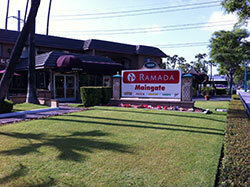 The Ramada Inn Maingate is a cheap Disneyland hotel in Anaheim, CA, at the corner of Disney Way and West Harbor Drive, right across from Disneyland. AAA discounts, outdoor pool. 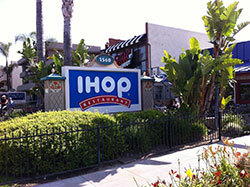 Right near the entrance to Anaheim Gardenwalk, where you can find additional restaurants and shops. 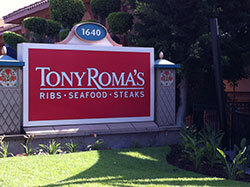 is one of the best restaurants near Disneyland. Try their ribs! 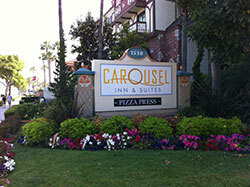 Located across the street from Disneyland, between the Ramada Inn and Anaheim Inn Best Western hotel. 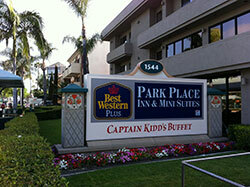 is a Best Western Plus hotel, with a great location just across from the entrance to Disneyland California. Discounts for AAA members. is the all American breakfast place located right across the street from Disneyland. They are open 24 hours a day, 7 day a week. 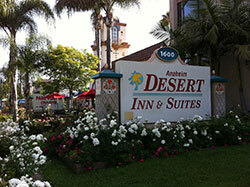 is another great vacation choice of Disneyland hotels in Anaheim California. 1600 S. Harbor Blvd. Anaheim Calif.
is rated one of the best Disneyland hotels in Anaheim, located right across the street from the Disneyland. It also has the yummy Cold Stone Creamery ice cream parlor. Last time we ate ice cream while we watched the Disneyland fireworks, no crowds! 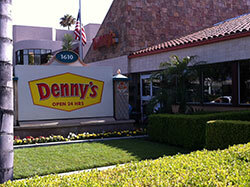 is another great family breakfast place located in the midst of the Anaheim hotels near Disneyland main gate. is one of the Disneyland area hotels with the best location right at the main entrance of Disneyland California. Captain Kidd's Buffet restaurant. AAA discounts. Here's a view of the easy walk across the street from these Anaheim hotels near Disneyland to the entrance of Disneyland California and California Adventure theme parks. 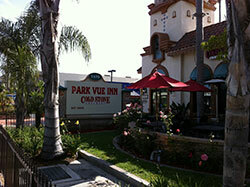 is a cheap Disneyland hotel with a great location right across the street from Disneyland CA. AAA member discounts. Espresso cafe. 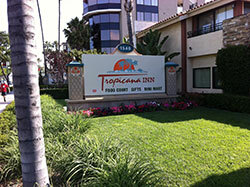 is another Disneyland hotels in Anaheim with the perfect location - right across from Disneyland resort. Eat pizza at the Pizza Press Restaurant and walk to Disneyland. 1540 S. Harbor Blvd. 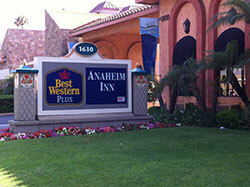 Anaheim Calif.
at Disneyland California is located in the midst of all of these Anaheim hotels near Disneyland. 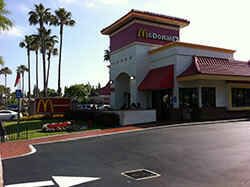 Get your comfort food at the golden arches, although we are partial to In-N-Out Burger. You can also park next door at a non-Disney owned parking lot. is one of the Marriott hotels near Disneyland. Use your AAA card or Marriott points at this 3 star hotel across the street from Disneyland California. Dine at Mimi's Cafe. 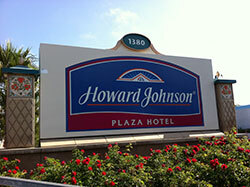 is another one of the best Disneyland area hotels located within a short walk of Disneyland CA entrance. Water playground and pools helped earn this 2012 Best for Families by TripAdvisor. 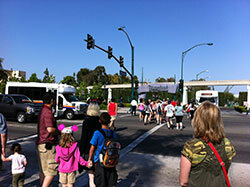 See additional hotels including the Disneyland hotel and additional Disneyland area hotels along S. Harbor Blvd. and West Katella Avenue in Anaheim Calif.
To see the map of Anaheim hotels near Disneyland, including the hotels listed on this page, just click on the link to the map shown above to open the map in Google maps.